When they followed their traditional LUNISOLAR calendar, now referred to as the kyu-reki (旧暦, former calendar) or inreki (陰暦), the Japanese were always in tune with the MOON and its PHASES. In fact, under that old system of ordering the days, months and seasons ( first introduced to Japan from Tang China via Korea sometime in the mid- 6th century), the days of the month were directly connected to the moons waxing and waning. Thus, it was possible on many specific dates to predict the shape that the moon would take in the sky on that particular night. Most famously, the FULL MOON (満月、mangetsu) would almost always appear on the night of the 15th (ju-go-ya, 十五夜) of each month ( though this year the full moon will actually appear the next day- TOMORROW- Sept. 23rd 2010). Since the Japanese government of the Meiji Period ( a time of rabid Westernization and modernization) decided to drop this old lunisolar calendar in favor of the solar based Gregorian one( in 1873), consciousness of the moon and its cycle has been ON THE WANE, as the dates of the NEW CALENDAR no longer coincide with the lunar phases. Thus, even though some modern Japanese calendars DO show the KOYOMI dates (in hard to notice, small print) , it is still easy to lose track of when important traditional ceremonies are coming up. It is ironic, that it is now CONVENIENCE STORES (an institiution which can be said to bear great responsibility in the precipitous demise of traditional lifestles and family relationships), which help remind the general public about the coming of one of Japan`s MOST ANCIENT AND ENDEARING CUSTOMS- O-Tsukimi ( お月見, Moon-Viewing). 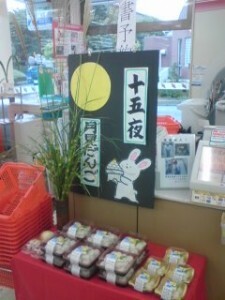 They do this by setting up displays ( which look charmingly home-made) featuring the iconic symbols of the event- moons and rabbits ( according to Japanese and Chinese legend, there is a rabbit on the moon! 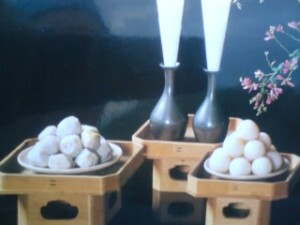 ), Tsukimi-Dango ( moon shaped rice dumplings) and Chinese moon cakes, as well as stalks of real pampas grass (susuki, 薄). 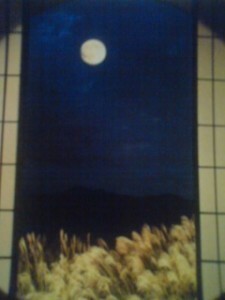 Though the moon`s beauty can be appreciated at any time of year, in Japan doing so is strongly connected with AUTUMN. In fact , in Haiku poetry the word moon- TSUKI (月), by itself , is a keyword indicating the fall. This is not only because at that time of year temperatures and weather conditions are at their most suitable for such outdoor activity at night, but also because, in the northern hemisphere, the moon seems to be especially large and NEAR to us during the autumn months. Moon after moon there are so many moons to be viewed, but as for a MOON-VIEWING moon there is none other than this moon`s moon! According to the traditional calendar, the months of autumn are the 7th, 8th and 9th, months. These roughly correspond to the Gregorian late August, September, October and early November. The custom of viewing the mid-autumn full moon (仲秋名月, chu-shu-meigetsu), which appears in the sky on the 15th day of 8th month (sometime in September or October according to the new calendar) while eating , drinking and composing and reciting poetry, was introduced to Japan from China. The oldest record of such a formal Chinese- style Moon-Viewing party held by the Japanese Imperial Court dates back to the year 856 ( the third year of the Emperor Saikou). However, many scholars believe that the Japanese people had been making offerings to the moon, in order to pray for or give thanks for a good harvest, since LONG BEFORE the Chinese style celebrations were introduced. The reason for assuming this, is that among the common people ( and later for anyone doing Tsuki-Mi), it was (and still is) the custom to offer SATO-IMO (里芋), taro, to the moon in this season , as part of a general rite of prayer called the HATSUHO-MATSURI (初穂祭り, Festival of the First Harvest）. 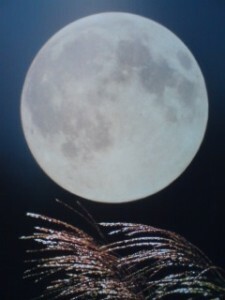 In fact, an alternate name for the mid-autumn full moon is the TARO-FULL-MOON (IMO-MEIGETSU. 芋名月）, which might just very well be a LIVING CONNECTION with Japans prehistoric, pre-rice cultivating past, when the taro was the staple food of the inhabitants of these islands. Another indication that there was a native Japanese version of the Chinese custom of moon-viewing is the fact that in Japan, it is considered incomplete, or even UNLUCKY to do TSUKI-MI only on the 15th day of the 8th month ( the day the Chinese do it)- which is tonight! Doing so is called KATAMI-TSUKI (片見月）, literally, a half-viewed moon. For a full and satisfactoryTSUKI-MI one also had to view the moon and make offerings on the 13th DAY OF THE 9th MONTH ( called- Ju-san-ya, 十三夜）. It is possible that before the Chinese custom of formal moon-viewing was introduced that the Japanese had a similar custom, involving offerings and supplications to the moon, which took place about one month later. It has also been suggested by commentators, that the shape of the moon on the 13th ( 十三夜), not quite, but just nearly full, is more appealing to the aesthetic sensibilities of the Japanese! An essential element for any Tsukimi event is some pampas grass. One thing that stands out in my memory is that every year at moon viewing time, the 7-11 near Doho Park, in Tsukuba, gives out free susuki to any one who wanted it . The significance of this plant is not only its being emblematic of the season. It also resembles rice stalks (though much larger, they are a member of the same family), and thus, moon viewing offerings symbolically connect the old slash and burn agriculture of prehistoric Japan ( the taro) with the culture of rice ( by the presence of susuki and the rice dumplings, in former times the real rice would not have been harvested yet). Susuki also has prickly leaves and stems on its leaves and is sharp where it is cut off, making it useful for symbolically driving away evil. Most importantly, the stalks act as YORISHIRO (依代), antennae which attract the spirit of the moon to the offerings ( at New Years Kadomatsu, bamboo and pine decorations, are yorishiro- and on childrens day the poles of the carp streamers (Koi nobori) originally had the same function. Last year the full moon coincided with the great Tsuchiura fireworks event. As I watched from the HANABI (fireworks) from afar, I was lucky enough to be able to occassionally see the mid-autumn moon whenever the clouds presented an opening. The people around me were all alternately viewing the Hanabi and the moon. It is hard to say which was more entrancing. If the moon can fill modern man( for whom it is merely a PIECE OF ROCK orbiting around the Earth), with such wonder, imagine how mysterious and even awesome it was to those who had no scientific explanation for it. Besides providing precious light at night, the Japanese realized that the moon did have an influence on the world around them, the tides, the activities of animals (sea turtles lay their eggs on full moon nights), etc. They also felt a strong connection between the moon and womens menstrual cycles and by extension childbirth. It is because of this that in Japan, besides the autumn moon viewing events, there were regularly held prayer meetings on particular days of the month ( depending on the community). In Tsukuba, such meetings ( O-Koh, お講) are still held on the 19th of the month. Numerous sacred stones attest to the fact that other nights were once popular for holding these gatherings at which women prayed for easy delivery and family health. 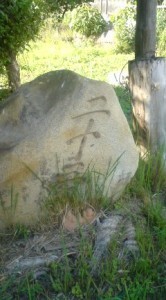 Probably the most common of these stones commemorate prayers on the 23rd night (二十三夜). You can do O-Tsukimi tonight- JU-GO-YA, or tomorrow night ( Sept. 23rd 2010) when the moon is truly full. You then have another chance next month.You too can join the minion of LUNATICS. In fact, the moon-viewing afficionados of old would enjoy not only the full moon of the 15th, but also, in their uncontrollable anticipation, watch the 14th night moon. This night was called MACHIYOI (待宵), the night of excited expectation! Then after the 15th, day by day, the moon rises a little later and its shape grows more and more cut-off. There are specific names the poets have given to each of these phases of the mid-autumn moon- on the 16th ( of the old calendar) you can view the IZAYOI (十六や), the 17th the TACHIMACHI-ZUKI (立待月), the 18th the IMACHI-ZUKI (居待月, and so on. This year the 13th night of the 9th month (ju-san-ya, 十三夜) will fall on October 22nd. If I could be bothered I would go down to Hojo beach but I am happy with just looking at your photos. Seeing the fireworks and full moon would have been spectacular. Avi-san I　sincerely regret that we missed Full-moon this year! Any way I have considered again about Japanese feelings toward moon, some I don’t know. Open You-tube and paste if you ever got time. No１，２　are Same famous folk dance and No3 is famous Japanese-Western style classic song. If there is any question please ask your Japanese friends. Tanko-Bushi:炭坑節:I think Avi-san knows very well. I would like to add another You-tube Title for your preperation of next summer’s Bon-odori(Japanese summer folk dance festival) some where. Try to remenber song and dance a little.